With the approach of December and snow on the ground, it is time to look back on what was a very successful year for the Fighting Saints program. The junior season began way back on Thursday, September 4th with the first practice of the year. The squad had a number of returning Grade 10 players and a large contingent of Grade 9 freshmen. This year the team was able to get back to its usual tradition of a pre-season scrimmage thanks to some great weather and the cooperation of the Westgate Tigers. The exhibition game is great preparation for the season, especially for those who have never played football before. The juniors roared out of the gate to a 4 and 0 record, thanks to victories over Hammarskjold, Churchill, Superior and Westgate. That set up a first-place showdown in the regular season finale with our cross-town rivals, St. Ignatius. Unfortunately that meeting resulted in a disappointing loss, but the team still secured second place and a first round playoff bye. The semi-finals saw the juniors square off with a dangerous Hammarskjold squad they had not seen since a week one 17-6 win. Aside from a few miscues, the team rode a strong defensive effort on route to a 31-13 win. For the second year in a row, and third time in four years, the juniors would now try to win their first city championship since 2002. November 8th dawned bright, windy and extremely cold. With wind chills hovering in the -12C range, it was not going to be an easy contest. Faced with a very tough St. Ignatius team that had dominated the regular season matchup, the juniors struggled to find any consistency on either side of the ball and lost 39-6. Although the title eluded the juniors yet again, it was another successful winning season. The team has upwards of 20 potential returning Grade 9’s, so they are in great shape for another run in 2015. The seniors held their first practice of the year on Wednesday, September 3rd. 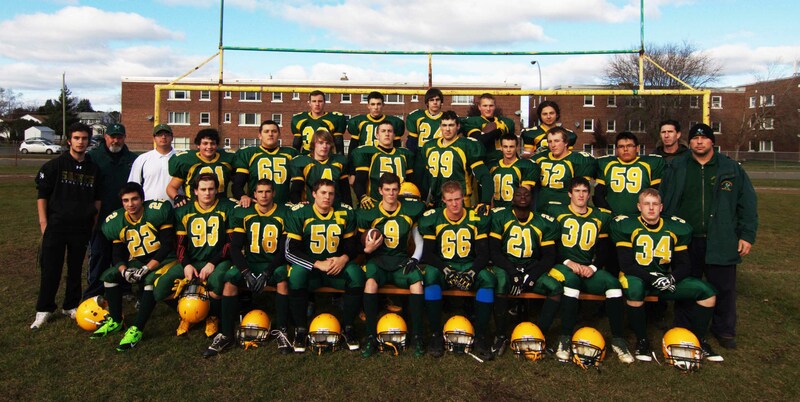 With a large group of Grade 11’s moving up from junior, the team hoped to erase the memory of the 2013 campaign’s 2-5 record. Since Superior did not field a varsity team this year, the seniors drew a first week bye and did not play their first game until September 19th. The team struggled at the outset, dropping 3 of their first 4 games. However they were able to find their stride after a huge upset victory over St. Ignatius. The seniors went on to win their next 3 games to finish the regular season with 5 wins and 3 losses, good for third place in the standings. The semi-finals would pit the seniors against a tough Churchill squad, with each team winning one game in the regular season. On a cold evening, a number of miscues put the seniors in a 24-14 half-time hole. However, the team rallied and roared back in the final minutes of the game, due largely to the arm and legs of quarterback Joey Ward. The 28-24 victory launched them into the championship game for the first time since 2009. In a repeat of the junior final, the seniors would face rival St. Ignatius to decide who would advance to the OFSAA Bowl game in Hamilton on November 28th. The game was very tightly contested, with the lead changing hands several times. The seniors seemed to grab the momentum with a late interception by Marc Degagne, but a botched hand-off on the ensuing series resulted in the game winning fumble recovery touchdown by St. Ignatius. The seniors should be well positioned to make another championship run in 2015 with the bulk of the team returning and a strong group of juniors moving up. Off-season training starts soon! Another season has come and gone for our football program. Now that the cleats have been hung up and snow is on the ground, it is time to take a look back at what was the 2013 season. Although it did not end exactly how we may have wanted, this year was another successful campaign for the junior squad. 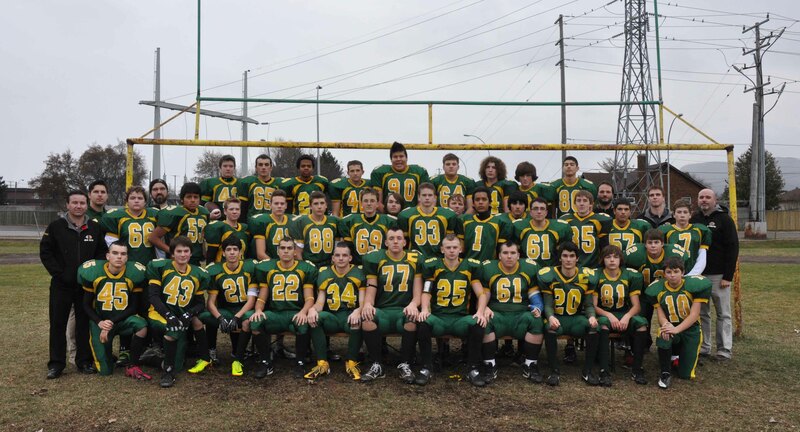 The team entered the season with 16 returning Grade 10’s, and a number of promising Grade 9’s. Practices began on Thursday, September 5th and by the following Monday all players were in full equipment. This meant that there would be approximately two and half weeks to get the team ready for the season opener on September 26th. Things got off to a shaky start however, with weather forcing the cancellation of the usual pre-season exhibition game on the 20th. For the first time since 2003, the juniors would begin the season playing someone other than our cross-town rivals, the St. Ignatius Falcons. This game would end up as a disappointing loss to the Churchill Trojans and the next week would end similarly, this time to St. Ignatius. The juniors were able to reverse their fortunes in the following two games, doubling up the Hammarskjold Vikings and the Westgate Tigers. With a record of two wins and two losses, the juniors would finish third and automatically advance to the semi-finals against number-two ranked Churchill. The team was in good shape heading into their bye week and certainly on an emotional high. During the couple weeks off between games, two junior players, Cody Baranyk and Kellen Steudle, were privileged to be called up by the senior squad and had some significant playing time in their game that week. The November 2nd semi-final would pit the juniors against a team that had soundly defeated them in week one. The team had improved significantly since that time, and had two weeks to prepare for the match-up. The juniors roared out to a 21-0 lead after the first half, and hung on to upset Churchill 34-29. This would set up a second trip to the finals in three years, and a re-match with number-one ranked St. Ignatius. What was anticipated to be a high-scoring slugfest turned into a tight, defensive battle. With five starters out of the line-up due to injury, the offense struggled to move the ball against a tough Falcons defense. However as the game progressed, the offense began to pick up momentum. Unfortunately the clock became the enemy, and the game ended as a disappointing 7-0 loss. Although the championship has eluded the team again, it was a great season. With upwards of 15 potential returning Gr. 9’s, next season promises to be equally as exciting. Spring camp is only 5 months away! The 2013 senior campaign was one fraught with challenges but also with some successes. With quite a number of returning players, including several fifth year athletes, practices began on Wednesday, September 5th. This would leave approximately one week and half to prepare for the season’s first game on September 20th. The opener began with the traditional match-up against our cross-town rivals, the St. Ignatius Falcons. At stake was claim over the Catholic Cup, which had been firmly planted at St. Pat’s for the last number of years. Unfortunately this round went to St. Ignatius and along with it the Cup (at least until next year). Promise returned the next week with a win over Superior, but the injury bug hit the team and a number of players were lost for the year. This precipitated heartbreaking losses to Westgate, Churchill and Hammarskjold which doomed the season. The very under-strength squad did achieve some redemption with a victory over Superior and finished with a final record of 2 and 5. With another sizable group of Gr.10’s moving up next year from junior, there’s a lot of hope for more successful 2014 season!